At the Nankudu District Hospital in the North Eastern part of Namibia’s Kavango region, nurses are busy preparing antiretroviral treatment (ART) medicine packs—just one of the many duties they have to ensure patients receive life-saving commodities. Nankudu District Hospital serves a population with an HIV prevalence rate of 15.9%. To reach patients in sparsely settled rural areas within the District, the hospital has set up Primary Health Care (PHC) clinics where nurses can dispense antiretroviral medicines to patients in villages with limited access to the main treatment sites, which are located in urban areas. As Namibia is the world’s second most sparsely inhabited country, it is common for patients to incur excessive costs as they travel long distances to receive medical care and collect their medicines. In light of these challenges, Namibia’s Ministry of Health and Social Services (MoHSS) is adopting a new service delivery model, shifting the responsibility for ART dispensing to PHC clinics to bring medicines closer to rural communities. As the country switches to a decentralized method of dispensing ARTs, it is imperative that health professionals carefully track the details of every patient interaction. Each visit to an outreach site must be recorded as it would have been if the patient visited a hospital to pick up their medicines. Patient interactions hold critical information that, if tracked, can improve patient adherence to treatment, encourage the adoption of patient-centered processes, improve the quality of care, and inform decision making. At PHC clinics across the country, patient interactions with the health system are recorded on paper-based registers, tally sheets, and patients’ health passports. Upon returning to the main dispensing site, the pharmacist enters patient data from the paper record into an electronic database on a desktop computer. This manual transfer of data was often delayed and incomplete, potentially resulting in poor quality data and the duplication of patient records. Pharmacists could be found spending a significant proportion of their time updating records, transferring data, and preparing reports rather than concentrating on clinical care. The MoHSS needed an innovative approach that would facilitate off-site recording of patient data by non-pharmaceutical staff and reduce the inefficiencies related to manual data capture. By integrating mobile technology, the Electronic Dispensing Tool (EDT) was adapted for use as a portable, hand-held scanner. The device, called EDT mobile, prompts users to enter real-time patient data on a simple interface, minimizing errors and data gaps. Patient data is stored until the device is connected to its docking station at the main site and all data is uploaded into the main EDT repository. After procuring 40 EDT mobile devices in 2013, the MoHSS’s Directorate of Special Programs (DSP) was eager to demonstrate how the devices enhance the efficiency of healthcare personnel and improve data collection. With the introduction of the Nurse Initiated and Managed ART (NIMART) model in 2014, strengthening nurses’ skills in patient management and data collection became a priority of the MoHSS. The MoHSS reached out to the USAID-funded Systems for Improved Access to Pharmaceuticals and Services (SIAPS) Program to pilot the use of the EDT mobile devices at PHC clinics by nurses and provide technical support to users. Due to the long distances between rural communities and main ART treatment sites and the high HIV/AIDS prevalence rate in the Kavango and Zambezi regions, these two regions were chosen to participate in this targeted intervention. In May 2013, SIAPS, in collaboration with MoHSS, began setting-up the EDT mobile devices at selected district hospitals and their associated health centers and clinics. PHC clinics were provided with limited 3G connectivity for electronic data migration to the national EDT database. SIAPS used an on-site, interactive training approach to orient healthcare workers on EDT mobile. Training focused on device set-up, medication dispensing practices, and software troubleshooting. In October 2014, a total of 43 nurses were trained in using EDT mobile and began using the device at PHC clinics in the Kavango and Zambezi regions shortly thereafter. 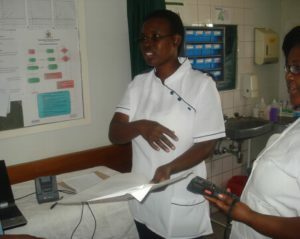 A nurse demonstrates the use of EDT mobile. Each month, nurses at Nankudu District Hospital’s five PHC clinics receive EDT mobile devices from the main ART dispensing site pre-loaded with patient data. SIAPS provided on-site training to the nurses on operating EDT mobile devices, effectively expanding the nurses’ skills in electronic data capture. Patient data entered on EDT mobile devices is password-protected and encrypted for security. Using these information-rich scanners, nurses can easily dispense medicines and record patient details electronically as they interact with patients. Using EDT mobile, the task of dispensing antiretroviral medicines and capturing ART-related data has been effectively shifted from pharmaceutical personnel to nurses in the Kavango and Zambezi regions. At all five of Nankudu District Hospital’s outreach sites, nurses are consistently using EDT mobile to record patient interactions. 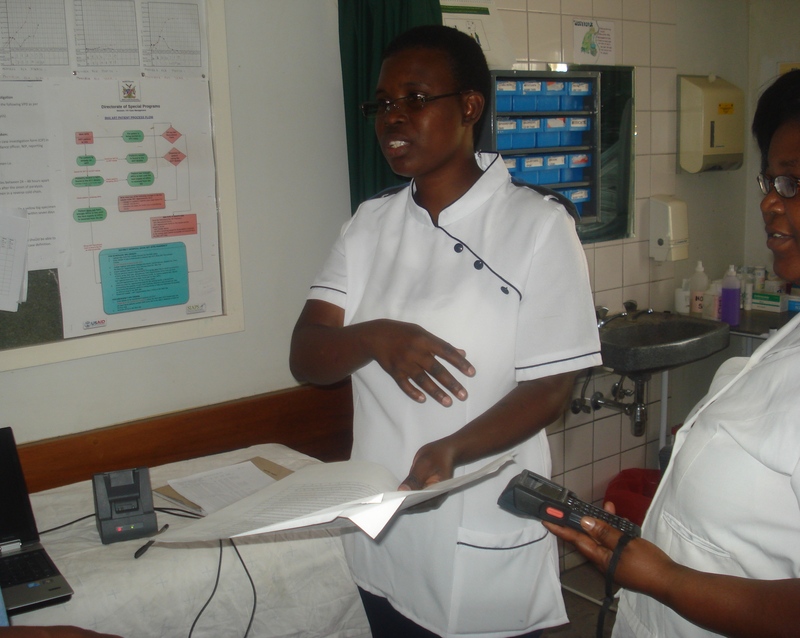 Nurses at Nankudu District Hospital have constructed a timetable to schedule when the device needs to be returned to the hospital to ensure that data is updated in the main EDT data repository regularly. Data capture has improved for 33% of patients in the Kavango and Zambezi regions. Hospitals and PHC clinics using EDT mobile have noticed a significant decrease in data entry errors because information is entered at the point of care into electronic records. With accurate data from remote regions, Namibia’s ART program has easy access to data for strategic regional decision-making on the quantification and forecasting of ARTs, minimizing the risk of interrupting the availability of ARTs at PHC clinics. EDT mobile lessens pharmacists’ workloads and decreases patient waiting times at PHC clinics. Since EDT mobile only processes transactions for patient management, the device can be used by nurses to handle single-patient interactions. Collecting patient data is no longer burdensome or time-consuming. Nurses can aid pharmacists in distributing ARTs, allowing pharmacists to dedicate their time to other critical tasks. Currently, 28,523 patients are accessing ART medications through EDT mobile at 24 PHC clinics in the Kavango region and 44 PHC clinics in the Zambezi region. The implementation of EDT mobile has successfully reduced the burden of collecting patient data by pharmacists and nurses. Through the widespread use of EDT mobile, accurate and complete data on ART use by hard-to-reach populations in the Kavango and Zambezi regions has become available. Surveillance Report of the 2014 National HIV Sentinel Survey (NHSS 2014), Ministry of Health and Social Services (MoHSS), pg. 18. Click here to view this story as a PDF.